April 7-13. 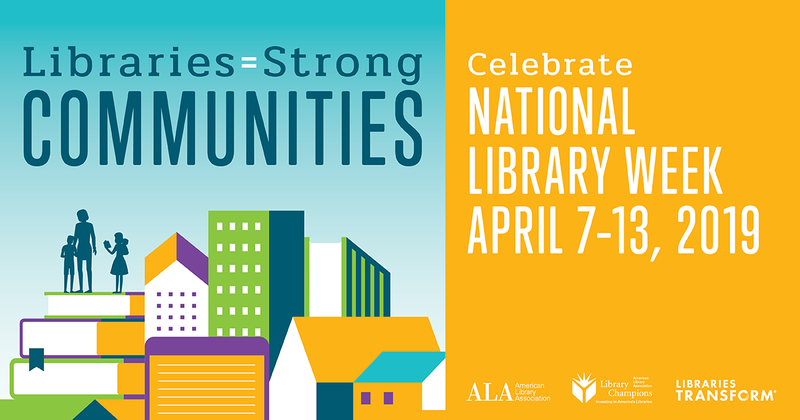 Join us in celebrating the many ways libraries are building strong communities and transforming lives! Support your library by visiting today. Available in Spanish and English. Available for families and staff. Please call us or stop by with your request. For the safety of our patients, we ask visitors who are ill or do not feel well to please refrain from visiting the library. Visitation in the library is limited to small family groups. Patients and siblings must be supervised by an adult family member wearing an armband or sticker issued by security. Volunteers and staff assisting patients and siblings. Everyone is asked to clean your hands when entering and leaving! These are newer and popular movies. They are available weekdays until 2 p.m. and weekends between noon and 12:30.They are due 3 hours after they are checked out. They must be returned by the time the library closes. Download Library Trek, search for Egleston You can access the library hours of operation, contact information and holdings. The Family Library has access to many types of health and medical information. In no way can this information replace the experience, knowledge and understanding that your healthcare providers bring to your particular health problems. Library staff can not offer medical advice. Please direct any of your medical questions to your healthcare providers at Children’s Healthcare of Atlanta. There is a wide variety of health and medical related information available on the Internet. The Family Library takes no responsibility for the content on these sites. Information found on various sites should not be used for diagnosing or treating a health problem or a disease. It is not a substitute for professional care. Please consult your healthcare provider if you have a need for further explanations or have questions. Under certain conditions specified in the law, libraries are authorized to furnish a photocopy. One of these specific conditions is that the photocopy or reproduction is not to be "used for any purpose other than private study, scholarship, or research." If a user makes a request for, or later uses, a photocopy or reproduction for purposes in excess of "fair use," that user may be liable for copyright infringement. This hospital reserves the right to refuse to make a copy if doing so would violate copyright law.